Ghost’s 2018 album ‘Prequelle’ cast the narrative back to the Middle Ages, and to the ravages of the plague on Europe. Far from being a sombre look at a disease which killed 30 – 60 per cent of Europe’s population, the record was a headlong dive into party-ready arena rock for the band, tracks like ‘Rats’ and ‘Pro Memoria’ loosely using the disease as a backdrop to a party so insane it would likely be your last. You’ll find absolutely none of that on Mastiff’s utterly devastating ‘Plague’. If ‘Prequelle’ was a non-stop party, Mastiff is the boil-ridden, vomit-inducing hangover, looking at the same subject but from a decidedly more brutal angle. ‘Plague’ is a record which drips in nastiness, every note dully utilising the band’s sludge-adjacent sound to make something which is uncomfortable to listen to and painfully oppressive. Don’t be fooled by the sludge tag, though; this isn’t a slow record, and nor does it spend too much time marching at glacial pace. It takes a full minute-and-a-half of build-up for ‘Hellcircle’ to kick in, but once it does there’s no stopping Mastiff, the band rampaging on like a rabid version of the beast for which they’re named. When not outright blasting speakers apart like low-end lurking Napalm Death, the band pull the pace back to lock in on some excellent groove riffs, or otherwise rhythmically smashing the listener’s skull apart with decisive blows. Whatever is in the water up north, it’s made for some seriously nasty low-end doom-tinged music this past decade, and Mastiff look to be the band that could wrench the title of Britain’s most oppressively heavy band from Liverpudlian doom force Conan. There are no moments of light nor melody in Mastiff’s world; things get nastier, they get heavier and sometimes they get faster, but they never get any nicer. The sounds of sobbing echo out at the start of ‘Quarantine’, and by this point you’ll know for sure whether ‘Plague’ is the record for you. After all, Mastiff aren’t here to head off in worlds of wild experimentation; they’re here to be as furious, dark and nasty as any band you’re likely to have ever heard. They achieve this through sheer aural terrorism, the low-end contrasting with howling sounds of feedback, like meeting one’s doom in the underbelly of some great mechanical beast. Where their faster riffs tend to clatter around with calamitous intent, the band’s true strength lies in their ability to slow things down to almost breathtakingly uncomfortable levels, the breakdown in ‘Vermin’ so incredibly horrible and unpleasant that it retroactively makes every over-used metalcore breakdown even more redundant than they ever were. After all, who could hope to match the sheer nastiness of a record like this? 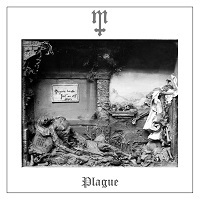 With no tracking throughout the record, ‘Plague’ comes off as incredibly raw, capturing the intensity of the band exactly as it would be live, like watching them in a supply cupboard while someone switches the heating on. And somewhere in the centre of it all is an almost sadomasochistic tendency that once it all finishes, you can’t help but want to start it all again. Like the cheap thrill of a jump-scare in a horror movie, or picking away the dry skin around a scab, this record insists on repeat actions and comes off stronger and more addictive for it. By the time the shrill cries of feedback single the start of ‘Black Death’ you know there’s no cure for it, except for the beast itself. This is a record which sets a precedent by which all heavy records can be judged for the rest of 2019, taking heaviness and turning into something so powerful and addictive that you can’t help but wonder if anything else will compare from here on out. ‘Plague’ is out now. You can get your copy HERE.